The usefulness of the Touch Bar on recent MacBook Pro models is dependent on whether or not a Mac app has been updated to take advantage of the handy OLED strip, but there’s one thing that most users set up immediately — Touch ID. A very useful feature of the MacBook Pro (15-inch, 2016) and later, and MacBook Pro (13-inch, 2016, Four Thunderbolt 3 Ports) and later, the Touch ID pad can be found on the far right side of the Touch Bar. Are you sure you want to erase ALL entries (yes/no)? At this point, you’ll be able to log into the MacBook Pro using your password. To set up Touch ID, click the System Preferences button in the Dock or select Apple (  ) menu > System Preferences. Once in System Preferences, click on the Touch ID button located in the lower row. 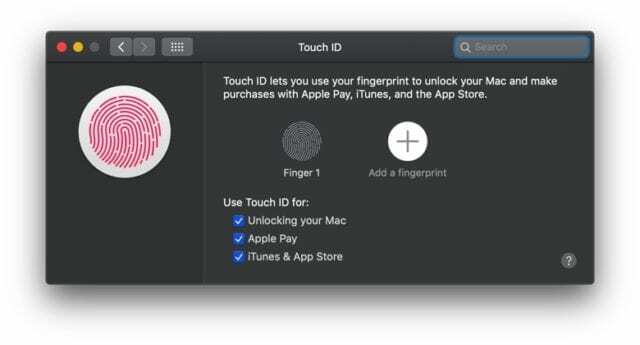 From the Touch ID preference pane, you’ll be able to use add fingerprints and set up Touch ID for unlocking your Mac, making payments with Apple Pay, and purchasing content from iTunes and the App Store.